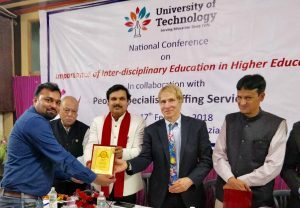 University of Technology, Jaipur organized one day national conference on Importance of Inter-disciplinary Studies in Higher Education on 17th February. The organizing secretary and the Dean Research of the university told that the objective of this conference is to promote interdisciplinary research in the areas of science, engineering and management. Giving the outline of the conference, he mentioned that the Interdisciplinary programs draw from two or more academic disciplines that work together to create a powerful learning experience and emphasize integrative learning, critical thinking, and creative problem solving. The conference was attended by more than 40 teachers from different colleges and universities. 30 scholars read their research papers in the conference. 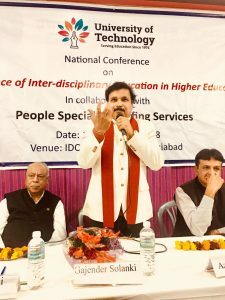 Among the guest were Vice-President(Education) ASSOCHAM Prof. M.K. Vajpayee, renowned poet and writer Gajender Solanki, well-known social worker and Gandhian scholar Ezaz Qamar Khan, CEO of Brain Fingerprinting LLC Dr. Lawrence A Farwell and President of Forensic Bureau of Investigation and Studies Dr. Gautam K Thawani. Key-Speakers of the sessions were Prof. Chandresh from J.P. University, Noida and Prof. Y.P. 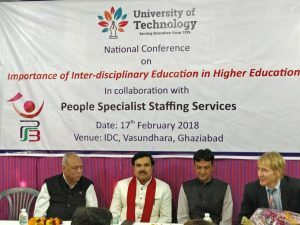 Singh from the University of Technology. 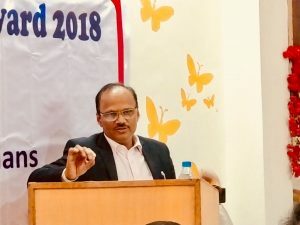 The conference was attended by participants from Gautam Budda University Greater Noida, Madhav University Abu road, SunRise University Alwar, Sanskriti University Mathura, Jai Narayan Vyas University Jodhpur, Avviare Educational Hub, Noida, S.S. College of Engineering Udaipur, SCET Kalol, LDRP Gandhinagar among others. The concluding remarks were given by Prof. Gandhi and he gave the gist of the conference. He mentioned that through interdisciplinary studies, students discover the value of integrating the study of various academic disciplines suited to their life-long interests and become interdisciplinary thinkers who analytically and creatively embraces new ideas. He also mentioned that students develop collaboration skills while working with others who have different perspectives and are prepared for graduate and professional study, and for careers in new and emerging fields. Deepa Prusty was the host of the event. Prof. S.C. Tyagi of IDC Foundation thanked all delegates and participants. The programme ended with national anthem.